The longest man-made structure in the world lends just a small portion of itself for one of the most beautiful and challenging races in the world. Apart from the full marathon, which is approximately 26.2 miles (42km), and half marathon which is about 13.1 miles (21km), there is a Fun Run in which anybody over the age of 12 can participate. Up until 2013 there were two additional races of three miles (5km) and six miles (10km) each but they have been cancelled in favour of the Fun Run which will go the same route. The race has two basic sections, one on the wall itself (in which runners famously climb 5,164 steps) and one which sees contestants running on reasonably flat terrain through picturesque villages and rice fields. 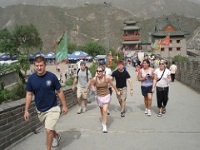 Although much of the Great Wall is very uneven, steep, and treacherous in parts, the marathon route is even and well-maintained so that no special shoes are required and injuries should be minimal. There are refreshment stations every few miles giving away water, energy drinks, and bananas. From a scenic point of view, it is without a doubt one of the most spectacular marathons in the world.